You know your child enjoys school when she wants to go to school on holidays. Zoey has been part of Kangaroo Kids Almeida Park since 2017, she started Playschool and has enjoyed every moment of her time since. I decided to continue with Kangaroo Kids as they have an excellent curriculum and the teachers that I have interacted with are just amazing. The entire team is a pleasure to interact with at all levels, be it senior management or the peons. You are always greeted with a smile and a helping hand. Thank you Kangaroo Kids for making the early years of Zoey so enjoyable!!! The enthusiasm and passion that brings Eleanor (my 3 year old) to school day after day - every day - makes “Kangaroo Kids” our best decision ever!!! The administration and teachers are amazing! They are all full of joy, happiness, love. The first thing my daughter sees every morning when she is dropped off is smiles, and cheerful greetings!! I don't need to worry about my daughter because I know in my heart she is very well taken care of. I know she'll come home with a smile on her beautiful face!! Kangaroo Kids has played an important role in the development of my daughters personal; social; and communication skills! Eleanor makes her own decisions, uses appropriate words to express her feelings and has an amazing vocabulary! All of this because her teachers give her the freedom to do things her own way and express her own unique individuality! our roller coaster ride of parenting, Kangaroo Kids has been a pillar of strength. Our first born went to Kangaroo Kids at a very early age of 1.5 years. From there for the next two years, the school and the entire staff and teachers took care of her and other kids in every way, while helping them progress in building their basic communication, logic and social skills. The fact that your child looks forward to going to school and is excited about meeting her teachers, says a lot. The queries, doubts and stresses of parents were always handled with great patience by the teachers and everyone else at the school. And it was the presence of individuals like the ever smiling Vidhi Chawla, who led the centre and yet was completely involved with the children and their parents. Its because of this experience that when it came to our second child, we didn’t think twice about Kangaroo Kids. All in all, its been a wonderful and fabulous journey that we have always cherished. 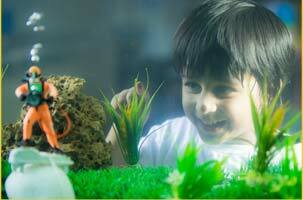 Welcome to Kangaroo Kids International Preschool, Bandra, Mumbai. 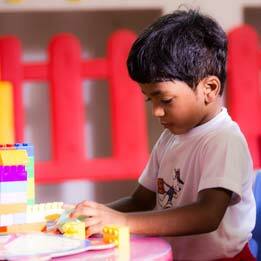 We are open for admissions to our Play school and Nursery school for the current academic year. 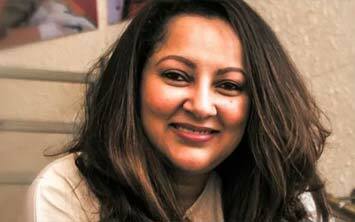 25 years ago, our founder Ms. Lina Ashar set up the first ever play school here in Bandra, Pali Hill which is now relocated to Almedia Park, soon after returning from Australia. Today, we have our presence in 100+ schools in 4 countries, including India, Maldives, Dubai and Muscat. 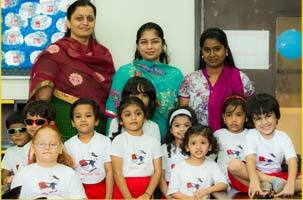 These include preschools, play schools, nursery and Montessori schools as well as middle and high schools. Our unique curriculum has been designed and developed by the team headed by our founder and has made a significant impact on young learners. 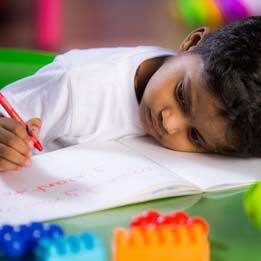 At par with international schools, our learner centric methodology has its basis in neuroscience studies and research. Every teacher is trained in this methodology so that children across all our preschools have the Kangaroo Kids edge. The key goal is to provide a holistic learning experience to children, which is achieved via innovative learning methods and a contemporary creative approach, instead of a traditional one. This has led to the organisation being awarded and applauded for its contribution to learning. Our classrooms at our preschool in Bandra, Mumbai, is a fun space where children are encouraged to explore and learn at their own space. 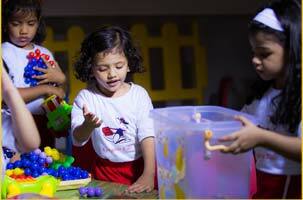 By engaging with art, music, play and outdoor sports, children are able to grasp concepts with ease. 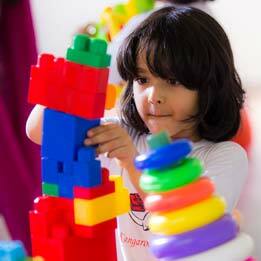 Here, their spatial, motor and cognitive skills are developed through the various activities. By providing curated books and toys, we sow the seeds of curiosity and a mindset of lifelong learning. We’ve recently introduced Yoga, Dance, Foreign Languages and Cubetto Coding for your pre-schoolers. As educators and parents, ourselves, we understand that safety is of primary importance, and hence have made a provision of CCTV surveillance and vigilant staff at all times. They are also equipped to handle minor situations which may require first-aid. Life-skills will always be more important than just academic achievement. Our teachers aim to instill the values of kindness, compassion and friendship in all our little learners, so that they become mindful adults and global citizens. We would be happy to have someone from our team show you our classroom and facilities in our preschool in Bandra, Mumbai, should you choose to do so.